Mosquito Squad Blog | The official BLOG site of Dread Skeeter. This is why we recommend using Tick Tubes in addition to our barrier spray program to eliminate Ticks and reduce the threat of Lyme Disease. Create a Lyme Disease Commission, charged with implementing the 10 Point Plan, enlisting the help of citizens and organizations who focus on Lyme disease. Create a Lyme survey, to determine the current key risk factors for contracting Lyme disease and other relevant statistics. Add a high-profile link to the front page of the Loudoun County website. Develop educational materials targeting different age groups. Organize a series of Lyme Education Forums within the County. Work with the local newspapers for a series of monthly articles regarding advances prevention and treatment, a spraying schedule for public parks. Establish a list of doctors that specialize in the diagnosis and treatment of Lyme disease and provide this information on the County’s Lyme webpage in addition to any new educational materials. Inform homeowners on the costs and benefits of spraying their yards for ticks. Provide a Lyme education awareness briefing to all children enrolled in Parks and Recreation outdoor programs. There are approximately 10,000 children enrolled in these outdoor recreation camps. Study the cost and feasibility of implementing insecticide applications that will immediately begin to mitigate the spread of Lyme disease in Loudoun. b. Four Poster Deer Feeders: With the VA Department of Game and Inland Fisheries (DGIF) study the feasibility of a county program for four-poster devices to control the tick population. Welcome to the official NV Mosquito Squad Blog! 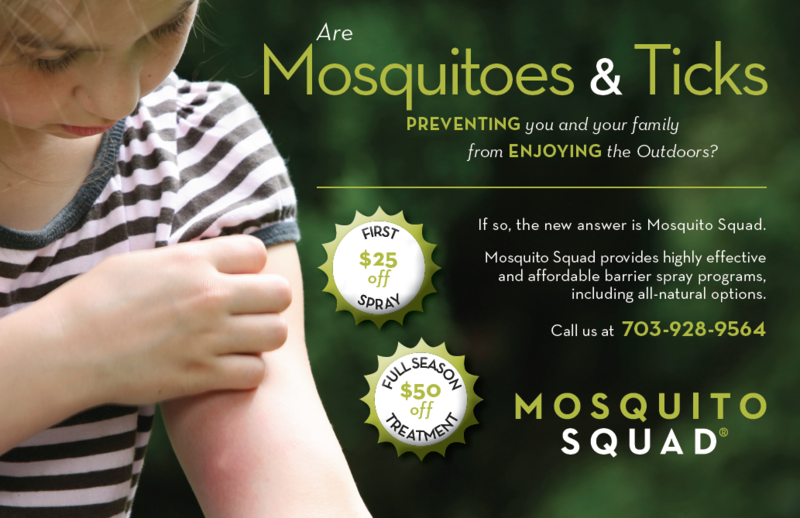 The Mosquito Squad of Northern Virginia can help you protect your family (and pets) from annoying pests that carry dangerous diseases. Our proven barrier spray program effectively kills mosquitoes and ticks, giving you the freedom to enjoy your yard without worrying about getting chewed up. By contacting the Mosquito Squad you will be taking the first step to reclaiming your yard and safely enjoying time outdoors.